I think this is a new feature with the Google Knowledge Graph. Spotted via Dr. Pete Meyers of Moz on Twitter - you can now find sport team rosters for baseball, basketball, soccer, hockey, etc when searching for a team name. Here is a search for the [NY Mets] - yes, finally after dozens of years they are doing well. 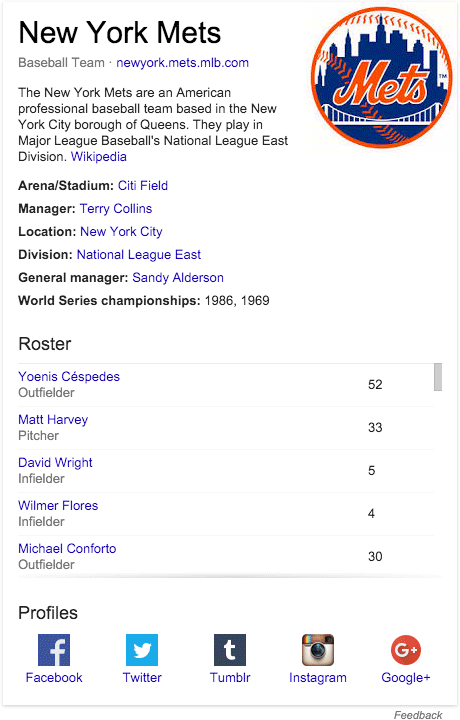 You can scroll through the roster and even click on a player's name to get their knowledge graph. I think this is new, so does Pete. Update: I screwed up, this is old.